YAOHAOHAO Handrail in stainless steel bath rooms, of the anti-slip barrier-free obstacle to maintain the aid/Home Care Shower Help & Support Security Handrail (Size: 60 cm). Welcome to our store, our armrests are beautiful, feel comfortable, durable and reasonably priced. Usually, our delivery time is 1-2 days, arrival time is 10-15 days. I hope you have a good shopping and look forward to your next visit! Handrails with stainless steel, beautiful, wearable, corrosion-resistant, durable. Armrest lines smooth and delicate, feel comfortable, non-slip, strong load-bearing. Size: 30C, 40CM, 60CM, you can choose according to your needs. Easy to install, strong load bearing, according to your needs, installed in the vertical, horizontal or tilt position. View More In Toilet Safety Frames. YAOHAOHAO Bright bath rooms, with the security accessible armrest TOILET TOILET TOILET slip resistant tub stainless steel the elderly disabled persons (Color white, their size: 68cm). YAOHAOHAO Tomb of the bars to bathroom space of aluminum bath rooms, glass slip, the elderly and children certainly slip handrail fixed control hand rails (Size: 60 cm). 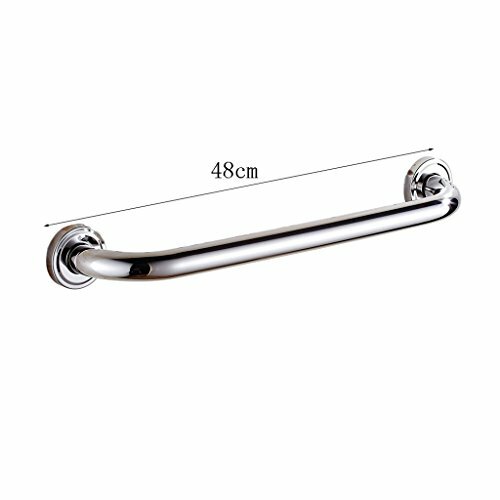 YAOHAOHAO Bathroom hand rails bath rooms safety handle toilet barrier-free lavatories barriers to the stainless steel non-slip shower (Size: 67 cm parapets safety bars). YAOHAOHAO Bath rooms handrail stainless steel + Security Nylon Slip-resistant grip for the elderly, children, pregnant women, persons with disabilities (Color yellow, its size: 3030 cm). YAOHAOHAO Shop safety handles antique barrier-free copper bath rooms Security Common hands TOILET dark glass non-slip control arm rest 32 cm 37 cm 47 cm 42 cm 52 cm parapets (size 37 cm). YAOHAOHAO Bathroom hand rails, bath rooms slip resistant of safety of the equipment of armrest aluminum 28 cm 38 cm 48 cm heel of special steels (Size: 48 cm). YAOHAOHAO The stainless steel bath rooms master bathroom armrest slip-resistant barrier-free bathroom hand rails hand rails older people glass shower handle rod (Size: 50cm). YAOHAOHAO Bath rooms handful of copper bathroom armrest barrier-free slip resistant bathroom hand rails hand rails older people glass handle shower shower safety bars (Size: 47 cm).